It seems fitting to start things off by introducing a single from one of the albums off the “most anticipated” album list of 2007. 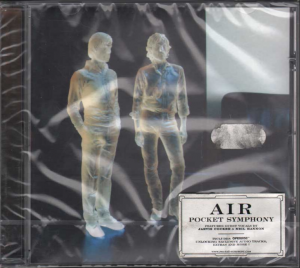 If you’re a proud owner of the Air collection – Premiers Symptomes (you must be very proud if you own this one), Moon Safari, 10,000 hz, Talkie Walkie – you’ll probably be jumping all over their forthcoming album, Pocket Symphony (if you haven’t already jumped on it). My introduction to Air didn’t come from Moon Safari, their first critically acclaimed album, but rather from Talkie Walkie. So you can imagine I’m a bit bias when it comes to their sound. In Talkie Walkie they were more accessible and a ton more poppy then on Moon Safari where they found exploration and experimentation to be their main focus. 10,000 hz is an album in between that doesn’t quite no where it’s going. There are wonderful moments on the album and some might even argue it’s their riskiest album to date. But with their new installment, Pocket Symphony, we’re taken far deeper in to Air’s dark side and sarcastic side. With the addition of Jarvis Cocker and The Divine Comedy’s Neil Hannon, we stray away from Talkie Walkie quite a bit. The latter album brought along some hard hitting singles like Surfing on a Rocket (watch video on YouTube). Some of you may remember this track from a Nissan car commercial. But Pocket Symphony offers us no real pounding moments. There are only a few tracks that could have been on Talkie Walkie, “Napalm Love” and “Mu du Japon.” The latter being one of my favorite moments on the album. But it’s tough for me to make too many more passing judgments about the album. I’ve got a couple more listens in me yet till I make my decision. I do like the subtle nuances of Asian music. According to Stereogum Nicolas Godin has been taking some music lessons from this guy apparently from Okinanwa. In “Mu du Japon” you get the full taste of their Asian influences. The first single off the album, “Once Upon a Time”, is a good introduction to Pocket Symphony. The main chorus is a bit hocky for me, “I’m a little boy, your a little girl, Once Upon a Time” but the overall tone sets the mood for the album. It’s a soft ride and reflects more early day Air rather than the Talkie Walkie sound.